Congressman James Comer met with House and Senate Farm Bill Conference Committee members Wednesday to begin formulating a final draft of the 2018 Farm Bill. 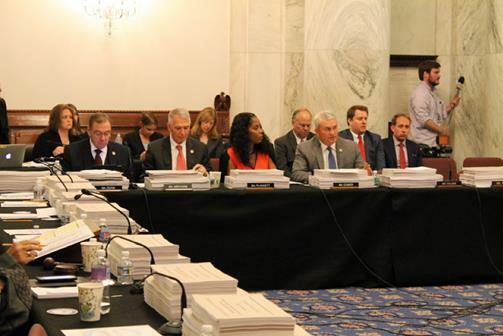 This marks the first meeting of the Farm Bill Conference Committee – an influential committee that is tasked with framing a final piece of legislation after working out differences in the Farm Bills passed by each respective chamber. The Conference Committee’s negotiated final product - the conference report - will then need final approval by the full House and Senate before being sent President Trump for his signature. Comer is the first Kentucky Representative to sit on a Farm Bill conference committee in nearly three decades, when representatives Carroll Hubbard and Larry J. Hopkins served as negotiators for the 1990 Farm Bill. Thank you, Chairman Conaway and Chairman Roberts, for your leadership in getting us this far. As we all know, moving a Farm Bill is a challenging feat. I am honored to be a member of this conference committee to help get us across the finish line and deliver on our promise to America’s farmers. Thank you, as well, to the staff of the Agriculture Committee for the countless late nights and long hours of hard work to advance the Farm Bill. As a farmer myself, I know the challenges my fellow farmers and all rural Americans face. Market swings, changing weather, trade disputes – all things outside the control of our constituents – are part of the everyday uncertainty that comes with farming. But we can do our part here today to ensure the Farm Bill is not among those. As a member of the House Agriculture Committee, I’m proud of the work we have done to craft a bill that builds on the risk management tools like crop insurance that were a focal point of the last Farm Bill. One of the top concerns I hear from Kentucky businesses is the shortage of available employees as they look to expand in our booming economy. The House Farm Bill takes steps to lift Americans out of poverty through the best assistance plan I know of – a job. The nutrition title emphasizes the importance of getting Americans back to work and provides a path for them to learn valuable job skills through training programs that will help them and fill the needs of employers. Specifically, to Kentuckians, I’d like to highlight two important provisions. First, the last Farm Bill opened the door to bringing industrial hemp back to America through the state-based pilot programs. As Kentucky’s Agriculture Commissioner, I had the pleasure of establishing the first of those programs and it has been wildly successful. I’m proud to work with Leader McConnell to take the next step to advance this valuable commodity by expanding the ability to grow industrial hemp by removing it from the Controlled Substances list and placing it under the USDA’s jurisdiction like other commodities. I encourage this Conference to adopt that language and provide farmers another tool in their toolbox. Another provision Kentuckians have brought to my attention is language in the Senate bill pertaining to the Rural Utilities Service Cushion of Credit program. While there are concerns about the sustainability of that program, I hope for an equitable solution that addresses the future of the program while respecting the financial commitments made in the past. Again, Mr. Chairman, I thank you for your dedication to rural America and the opportunity to play a role in finalizing this crucial legislation. I look forward to the progress we will make and I yield back my time.